I know I have posted this recipe in the past, but it was with 3 other slow cooker recipes. I believe this soup deserves a post of it's own. It is really easy to make and really satisfying on a cold day. I realize most of you are thinking, "Um lady, it's mid-March, Why are you cooking soup? It's too warm for that!" Well dang it all...it is cold here today. 25 degrees freezing a$$ cold. So I'm making soup because I am cold! Saute onions in olive oil in a skillet until transparent. Once the soup is ready to serve ladle it into a bowl and top with a slice of toasted bread and cheese. Broil for a few minutes until the cheese is slightly brown. 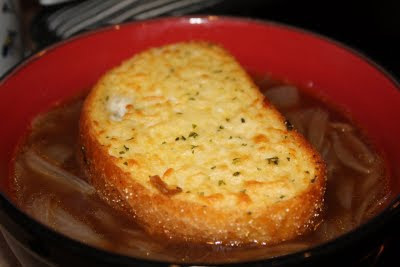 Croutons are also a good french onion soup topper. So just whatever bread suits your fancy. Gary requested a bread bowl, but that is NOT happening. I'd love it, but I'm trying to quit bread. I know I'll never fully quit bread, but today I quit bread, so no bread bowl. This soup reminds me of my Auntie. I got the recipe from her! Happy Thursday friends...two more days until Spring Break! Whooo Hoo! Sounds so yummy! Def going to add this to my recipe box! Oh my goodness that looks so good!!! Most recipes I've seen have Sherry in them and we don't buy alcohol so we'll have to give this a whirl. YUM!!!!! !